Even in Michigan mountaintop camping is possible. There are many places scattered across the Upper Peninsula where you can pitch a small tent on knobs and open ridges and then spend an evening watching the sun set over acres of forests, river valleys or entire lakes. Wolf Mountain in Ottawa National Forest is such a place and it’s an ideal high camp for those with short legs. The 1,826-foot summit is the highest point in Gogebic County and a gorgeous place to enjoy long views to the south and west in a relatively undeveloped area. Even in Michigan mountaintop camping is possible. 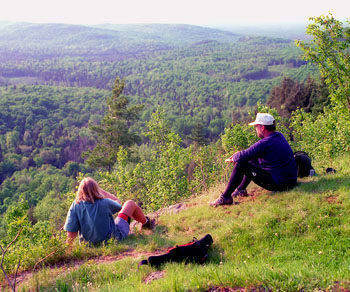 There are many places scattered across the Upper Peninsula where you can pitch a small tent on knobs and open ridges and then spend an evening watching the sun set over acres of forests, river valleys or entire lakes. 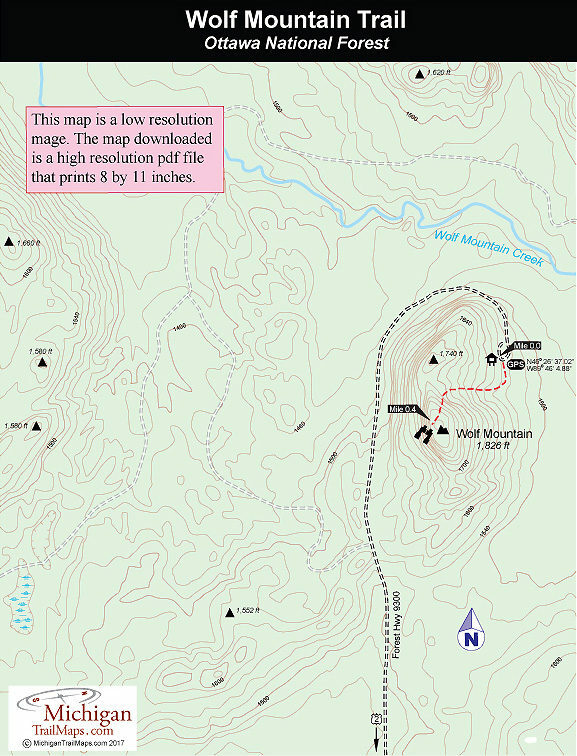 Wolf Mountain in Ottawa National Forest is such a place and it’s an ideal high camp for those with short legs. The 1,826-foot summit is the highest point in Gogebic County and a gorgeous place to enjoy long views to the south and west in a relatively undeveloped area. Lake Superior is not visible but the spot is still a favorite of locals who drive up for the fall colors in early October. You drive within half a mile of the top, then a short hike takes you the rest of the way. At the peak there is more than enough space to pitch a tent or several of them. The start of the trail is reached by turning north onto Forest Road 9300 from US-2 southeast of Wakefield. After crossing Little Presque River on FR-9300, you’ll see the mountain before reaching the trailhead at the end of the road. The parking area is a cul-de-sac and from there the trail is clearly visible heading into the forest to the south. The trek to the top is less 0.4 mile from the trailhead and the hike is a stiff climb up. But within 15 minutes or so you're on a rocky knob looking at a 180-degree panorama. 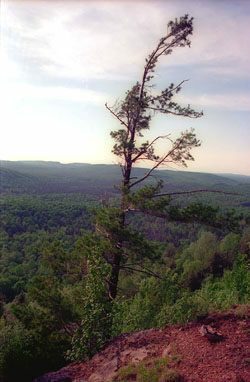 The scenery is a rugged ridgeline to the west while to the south is an endless sea of pines that stretches into Wisconsin. It's such a great sunset watching spot, some campers have made a rustic "lounge chair" out of logs to enjoy it. There are no facilities at top of Wolf Mountain or at the trailhead parking area. You must carry everything in, including water, and, more important, carry everything out. There are the no vehicle or camping fees at Wolf Mountain. From US-2, 5 miles west of the turnoff to Marenisco and 8 miles east of Wakefield, turn north on Forest Highway 9300. Follow the dirt road for 3.2 miles to the unmarked parking area at the end. For more information on Wolf Mountain, call the Ottawa National Forest Headquarters (906-932-1330) or the Ottawa National Forest Visitor Center (906-358-4724).